The 25 best Classic Comedies? About the life and death of the legendary Swedish/American agitator Joe Hill. The idyllic life of a young Cajun boy and his pet raccoon is disrupted when the tranquility of the bayou is broken by an oil well drilling near his home. A serial killer is targeting women in the seedy district of Montmartre. Man calling for Mrs. Jones: [Calling out loud] Mrs Jones! Mrs Jones! Ole Olsen: [Firmly] Look, here, my friend, we are making a motion picure here. Man calling for Mrs. Jones: Mrs Jones! "Anything can happen and it probably will"
A Hollywood chorus carols in saccharine style: 'I once had a vision of Heaven, and you were there', only to fall straight through the floor... into the infernal regions where, the opening title tells us, any resemblance to a motion picture is purely coincidental.' Well, there is quite a lot of resemblance, but the wildness of the ensuing number, full of devils gleefully "canning" their victims, announces that this is not going to be one more musical. Ole Olsen's and Chic Johnson's only film triumph has the virtues of its limitations. It came to the screen as a freak Broadway hit, a melange of old sch-ticks, novelty acts and occasionally inspired improvisations which caught the theatre public's fancy in the late 1930s. How to squeeze all this into a film, given that straight recordings of revues had gone by with the talkies' earliest days and cinema-goers usually failed to warm to staginess, unless it was transformed into Busby Berkeley spectacle that would not chime with a crazy comedy? Probably more by another fluke than by calculation, Universal stumbled on the answer: make the impossibility of fixing theatrical spontaneity on celluloid the main running gag in the picture. The result is unique: structurally, if not frame by frame all through, this is the most playful travesty of movie conventions ever to become a big hit for a big studio. Much of the vaudeville material has dated, though pleasantly enough- the Congeroo jitterbugging is a wow- and some of the gimmicks become familiar by imitation; but boredom is avoided, and several laughs- such as the taxi joke at the beginning. the "Rosebud" line and Cook's bullet-proof vest at the end- are imperishable. How did it happen? Most of the principals, including director Potter, and the stars, were theatre and vaudeville rather than Hollywood types. The script sports its scorn of movie narrative rules, not just in John B Fulton's special effects (freeze, reverse motion, a reprise of his Invisible Man trickery) but in its mockery of plot conventions. A millionaire pretending to be poor so a rich girl will love him for himself? "That's crazy!" "That's movies!" Mischa Auer as a genuine Russian prince in exile pretending to be phony? It's so the socialites will be amused at knowing his non-secret and will pick up the tab for him, whereas a real nobleman is banal and has to be a waiter. A lavish musical show, with water ballet, mounted in a country house? No problem if Chic and Ole can wreck it, in a good cause. No doubt other drawbacks governed the screwball treatment. Olsen and Johnson were not built for slapstick, hence other forms of visual excitement. More seriously, and despite faint echoes of Abbott and Costello, they were a fairly bland and over-ingratiating duo. Like Rowan and Martin, they anchored and mediated the eccentricities of Auer, Martha Raye, Hugh Herbert etc and explained, or protested about, the film's oddities. 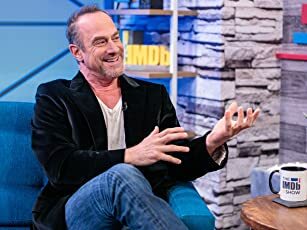 Breaking the frame, giving the game away to the spectators, arguing with a behind-the-scenes collaborator in front of the paying public: heretical in Hollywood, not so unheard-of on the New York boards where comedians played to their claques. Temporarily O&J gave the off-the-wall comedy an extended life, just as the Marx Brothers were flagging. Like the brothers at MGM, Ole and Chic played matchmaker to more sexually appealing support, took a break for musical or romantic interludes and had road-tested their own contributions: not by sneak-previewing them but by dint of having done the show 1,400 times already. The world war would speed up the tempo of such entertainment, as would the influence of radio, with its avoidance of 'dead air'. Jokes about the draft and shortages have crept into the Hell scene, and throughout the pace is snappy. However their later films, after the first reel of "Crazy House", showed that O&J could not extend their partnership as fruitfully as Laurel and Hardy, the Marxes or the Ritz Brothers. Or Hope and Crosby, whose "Road" series, with their talking animals and to-camera asides were mining the same seam. Never mind. 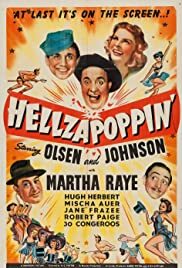 The director may have shot the screenwriter in disgust at the finish, but nearly 70 years on, many will find "Hellzapoppin" a lot more fun than "Being John Malkovich", and as cinematically quirky.